Few of us think that the city we live in is perfect. 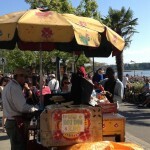 Find any city that looks wonderful at first glance and you will also find a city where citizens are actively debating, complaining, proposing and advocating. That is as it should be. In fact, it may be that the most interesting cities are those where people are most ‘creatively engaged’ rather than passively appreciative. Even so, it is interesting to check the visitor’s perspective from time to time. 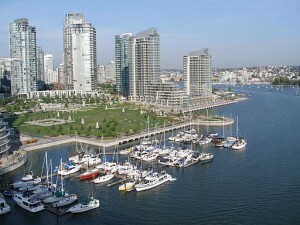 Vancouver regularly places high on ‘livable cities’ lists. Yet activists there complain that there is little cycling infrastructure, that traffic congestion is a major irritant, and that its high housing costs render it much less livable for people on low or modest incomes. So I was interested, on a recent visit, to see what this outsider’s first hand impressions would be. The early summer weather was gorgeous when I visited so Vancouver, with its backdrop of mountains and water, was looking pretty spectacular. Speaking of mountains and water, it’s a theory of mine that most of the world’s great cities are constrained by geography. This is often what gives them density and forces them to grow up (both literally and figuratively). Cities that have no constraints on sprawl will sprawl – and will feel like a web of suburbs rather than a city. So downtown and west end Vancouver can thank the Strait of Georgia and the Coast Mountain range. My various short forays around downtown Vancouver found a busy, energetic young city – but not a downtown that stands out above major cities elsewhere. On an early morning stroll, the empty separated bike lane on Hornby St. could be read as a statement that it’s unnecessary. Or one could note that the sidewalk and car lanes are also mostly empty – it was early morning – and the flattened beer carton is a reminder that streets have many different uses and functions over the course of their days and years. 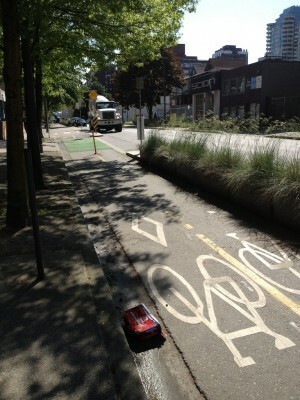 When I came back at other times, the bike lane was in use. 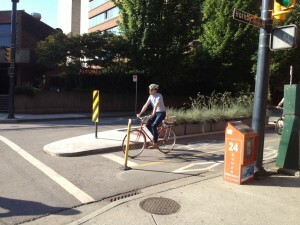 The usage question is one that fill challenge many car-centric cities. Sure, if you build it, they will come. But a bike lane here or there is not a bike infrastructure. 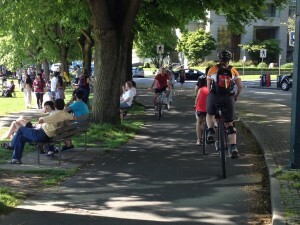 A single bike route will remain under used unless it is connected – connected to pedestrian routes, to other bike routes, and to important destinations. 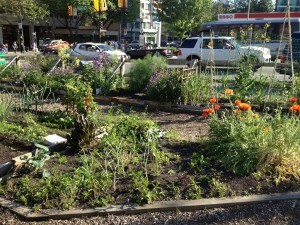 Not far from the Hornby St. bike lane is another symbol of new urbanism in action – an urban garden. Directly across the street, in this case, from an Esso station. And, apparently, the site of a former Shell station. Is the gas economy giving way to the plant economy? It’s a small step but it is a step. 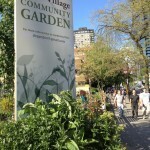 Davie Village Community Garden is also an example of constructive business and community collaboration. While it is a temporary land use, it sure beats the standard parking lot. These kinds of innovative projects give people ideas and practical experience for bigger, more permanent changes. 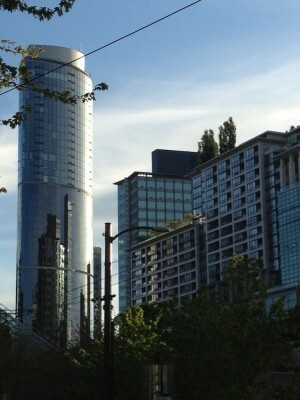 Did I mention it was a warm, sunny day on the weekend? 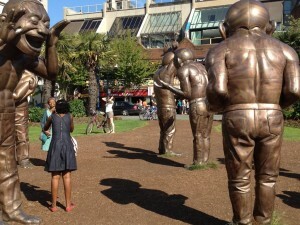 I continued my amble down to English Bay and here the real importance of great public space was on full display. Thousands of people were out soaking up the summer – tanning on the beach, having an impromptu picnic, reading a book, visiting with friends, showing off their city to relatives from afar, listening to tunes, getting some exercise. The list is long because beyond the common factor of being outdoors, enjoying the weather, people are diverse. This is sometimes what urban space designers forget. A lot of design elements work well on English Bay, where the water and downtown and Vancouver’s major park (Stanley Park) connect. As an example: linked but differentiated spaces for sitting, walking, running, cycling, and driving cars. Here’s one shot that shows all of those. And finally, an appeal to good humour. Cities need this, despite the short sighted who don’t get the value of art. The cast bronze sculptures in Morton Parkare not only conversation pieces – they are interactive reflections of our humanity. People stop, look, pose, take photos of one another. Or in my case, take photos of people taking photos. One of the purposes of public space in a city is to showcase our own humanity – to encourage us to see one another not as an anonymous crowd but as individuals with personality. The Morton Park sculptures do just that.